Editor's note: In this post, we’re sharing some of the great work that colleges and universities are doing with the help of Google for Education tools. To learn more about Google’s solutions for higher education, come visit us at EDUCAUSE – the largest higher education EdTech event in the US – October 27-30 in Indianapolis, at #1110 in the Expo Hall. We’ll be demoing the latest products with Googlers, administrators, professors and students giving short presentations throughout the week. And if you can’t attend EDUCAUSE, be sure to join our webinar with University of Texas at Austin on November 17th at 2pm EST / 11am PST. Many higher education campuses are home to tens of thousands of students, thousands more staff, and dozens of buildings and academic departments — not to mention online learners. How do you create community and enable collaboration in academic settings that are the size of small cities, while making it easy for everyone on campus to learn and work together? Millions of students, teachers and administrators at colleges and universities around the world use Google Apps for Education to access their coursework from anywhere, communicate at any time, and share ideas for academic projects. In fact, the majority of U.S. News & World Report’s top 100 universities use Google Apps. Here’s how several major universities have brought professors, students and departments closer together. Introducing new technology tools often means adoption delays and integration headaches. 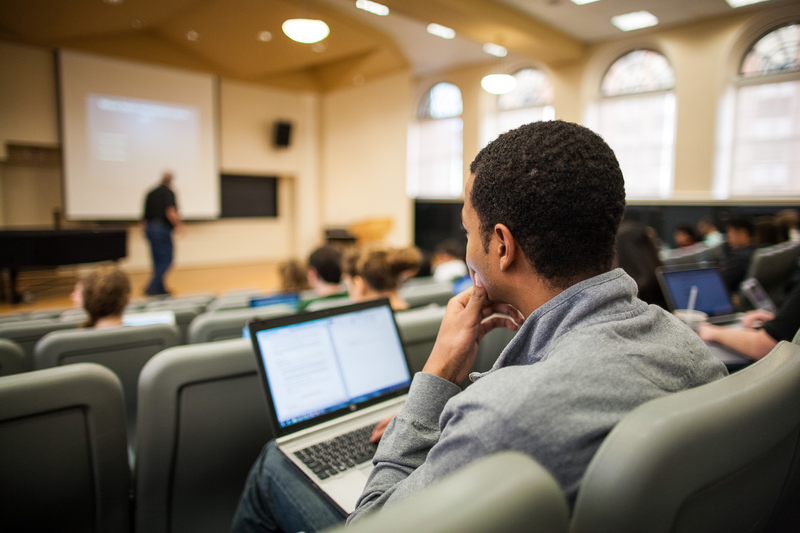 At schools like Georgetown University (case study), where Google is already the top choice of many students and faculty for email and collaboration, using Google Apps for Education for official school business was a painless transition. The high awareness of Google Apps, and its seamless integration with other systems, was also a deciding factor at North Carolina State University (case study). “For the students, many of whom were already using Google, it really was a no-brainer,” says Sarah Noell, an assistant director in the school’s Office of Information Technology. The students running Brown Market Shares, a food distribution program, use Google Drive to share meeting agendas and customer check-in sheets. “Using a Google Doc for our weekly meeting agendas, is useful because we can each add items to it before the meeting at any time of the day or night,” says Meagan Miller, an undergraduate student and Brown Market Shares’ communications coordinator. There are many more stories about colleges and universities that are are re-thinking the ways they learn and work. If you’re in Indianapolis, we hope to see you in the EDUCAUSE Expo Hall at #1110. And if you can’t make it to the conference, be sure to join our webinar with University of Texas at Austin on November 17th at 2pm EST / 11am PST.